We never planned a big rescue. In fact we hadn’t planned a rescue at all. It just happened after dark one summers evening. I looked around our home which wasn’t quite ready for the amount of waifs and strays she had in mind. But we did have a couple of outbuildings, enough to house a few hens. I wasn’t quite sure how many she had in mind and it was just as well. But I would get enough food in ready for the poor and unsuspecting creatures. My mind was made up. ‘Count me in,’ I told her. ‘It’s better we don’t mention it to my kind and unassuming husband,’ I said to my cousin. ‘He would never agree to do anything so wrong even if it is the right thing to do...in our eyes!’ So my kind and unassuming husband was totally unaware of the major rescue operation we were about to undertake. The following evening, I met my cousin in a quiet lane near the battery farm. She had a friend with her with plenty of experience. My stomach began to churn and my sweaty hands slipped on the leather steering wheel. I felt like a criminal. I guess I was, at that moment. As I followed the car in front, I wondered what my kind and unassuming husband would think of my behaviour. I have done many things in my life, like working illegally in places abroad, sometimes with fake work permits. I was very young and the need for survival was great. But that was a long time ago and just one of the thousand lives I once lived. I’m now an above board person helping others to survive, with the help of my kind and unassuming husband. And that’s what I was doing, helping others to survive! We pulled up in the shadows of a huge windowless building which had the makings of a jail. It was a jail! There were a few people about but my cousin didn’t seem at all bothered. Her friend had everything in control. Then it happened...from that moment on, my life was never the same again. It happened so quickly. I will spare you some of the details but some you have to know. A man in overalls and a flat cap greeted us coldly. He was the jailer. My cousin’s friend seemed to know him which helped somewhat. He opened the large door to the jail. I Froze. There were cell like cages, millions of them (that’s what I remember thinking at the time) all piled on top of each other and the smell.....Oh the smell! But this wasn’t the time to be sick. This was the time to get what we came for and run for it. The jailer opened up some cells and told us to hurry. He threw boxes on the floor and left us. The light was dim but enough to see the debilitating state of these innocent hens. Hens that had never known what it was like to see daylight, nor stretched their wings or had a dust bath in the sun. They had never teased a worm from the earth or a snail from its shell. I didn’t think for one moment that I would be killed for saving the lives of ill treated hens, but who knows! I placed my hands around the first hen, touching the stubs where feathers should have been. Into the box it went, then another and another. Slow to start then picked up speed. The noise was eerie, almost as if they knew that death was coming. I could feel their muscle wastage, due to lack of exercise. Remember, that these poor creatures had a space the size of an A4 piece of paper, or less. Some of their feet were so lacerated that we had to ease them off the wire floors they stood on. For many, it was too late; they lay dead, beneath their surviving house mates. A release from the pain and suffering there was no need for. When the boxes were full we placed as many hens as we could into our cars, with little thought of how we would drive them away. And when it was over, it seemed such a small amount to the thousands we had to leave behind. Each inward breath fuelled my anger. The jailer came back. He asked us to leave but I couldn’t. I ran back and tore open a cage. I will always remember that moment. I wrapped my shaky hands around an unwilling hen. She didn’t want to leave. ‘Come on girl,’ I tried to coax her but she cried and clung on to the wire with her claws. Then I saw the egg rolling away. I grabbed it. ‘So this is what you want?’ I said through my tears. ‘That’s not a problem. ‘One day you shall have a wee one of your own, I promise!’ And I tucked her inside my jacket with the egg (which surprisingly, never broke). ‘Why, there’s more meat on a sandwich than on you,’ I whispered. And that is what I called her, Sandwich! Her story is on my ‘small tales’ page. Just as I was about to be dragged away by my cousin, I saw her. She had lain beneath Sandwich, bloody and close to death. But I couldn’t. I picked her up gently and held her close to me. That is how I drove home, with Featherpin on my lap, bleeding and almost unconscious and Sandwich, still tucked inside my jacket. I can’t remember a time when I cried so much. The pain of leaving so many hens that had never known kindness was overwhelming. I needn’t tell you how my kind and unassuming husband greeted me, because you should know that already. Shortly afterwards, a hundred bewildered but very lucky hens were sleeping on a bed of straw for the very first time and when they awoke in the morning, it was to the sound of birds and a sun shining through the cracks in the wood. They were safe in the home for waifs and strays.....to be continued! I would just like to add this quote, from a study done at Bristol University on hens and other farm animals. 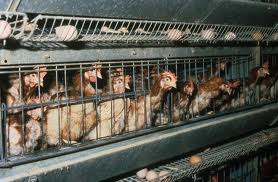 “Farm animals feel pleasure and sadness, excitement and resentment, depression, fear, and pain. They are far more aware and intelligent than we ever imagined... they are individuals in their own right." On chickens specifically, Discovery Magazine explains research from the University of Bristol: "Chickens do not just live in the present but can anticipate the future and demonstrate self-control... something previously attributed only to humans and other primates..."